China had set out to achieve high goals in space. After successfully implementing and using their first space station Tiangong 1 and its slightly larger variant Tiangong 2, they aimed for a large space station complex that could rival the stations of NASA and even more so, the Soviet Union. The payload capacity of the Chinese space program however was sorely lacking. The nearly nine tonnes of the Tiangong station modules put a strain to the existing Long March 2C/D launch vehicle. The leadership realized the need for extra payload capacity early on and had already begun the development of a new launch vehicle, targeted for lifting up to thirty tonnes into low earth orbit. The existing storable hypergolic fuel mix of N2O4 and UDMH was seen as inadequate. While it allowed for a simple engine design that could easily be optimized, the fuels themselves were not considered to be very safe. This lead to the decision to search for a different fuel mix that was safer to handle and, as a bonus, could be stored without needing complex cooling systems. A Chinese aerospace engineering student, who had been in Cambridge for a student exchange, had discovered the early use of High Test Peroxide and kerosene rocket engines by the British for the Black Knight launch vehicle. His information proved to be valuable for the development department and he was offered a job after finishing his education. While there was difficulty in handling HTP, it was considerably safer compared to UDMH, as improper handling would only create steam and oxygen, rather than being poisonous like the other two. RP-1 grade Kerosene was similarly easy to handle. The Chinese aerospace engineers therefore decided to develop a new HTP/RP-1 engine and tested it successfully during the mid 1980s, during the development of the new Tianlong launch vehicle. To not push their luck however, they decided to go for the more well known N2O4/UDMH fuel mix for the second and the optional third rocket stage. The first two stage version of the Tianlong was ready in 1989 and launched on April 1 from the Xichang Launch Complex, successfully delivering the twenty five tonne core module of the new Tiangong 3 space station into orbit. The first third stage version launched on August 14, carrying a Chinese two tonne telecommunication satellite into a geostationary orbit. Until 1994 Tiangong 3 was expanded with four more twenty five tonne modules, allowing for up to eight taikonauts to be stationed in space at all times. To support the long duration missions, a cargo carrying version of the Shenlong was developed, the Dilong, capable of carrying up to four tonnes of cargo. While near earth orbit was a good way to get experience with operating spacecraft and space stations, China’s government wanted to show what China was capable of and land a man on the Moon, without any external help. Once again taking inspiration from the United States and adapting an unrealized spacecraft, China developed the Penlong. The Penlong was a relatively simple and low weight spacecraft, capable of carrying one taikonaut, land on the Moon and return to orbit. While this was similar to the Soviet LOK lander, the Penlong removed anything not deemed necessary. The taikonaut would sit in an unpressurized cockpit with simple computerized controls, above the lander engine and between the propellant tanks. By using hypergolic fuels the mass of the Penlong was as low as four tonnes, well within the Chinese capability to send to the Moon. The Penlong was tested within Earth orbit between 1994 and 1995. As several problems surfaced during the tests, leading to the death of one taikonaut and heavy injuries of another, the first lunar landing was targeted for 1997 to modify the Penlong for more safety. An unmanned version of the Penlong touched down on the lunar surface on June 2, 1995, two weeks after the European landing on the Moon. Several more unmanned landings followed, while a modified version of the early Chinese spacecraft, the Shuguang II was developed to carry two taikonauts to the Moon. To deal with the threat of weapons in space, the Shuguang III became the spacecraft of choice, armed with two machine guns, four missiles and equipped with a solar array to allow for longer duration patrols in orbit of up to thirty days. During these thirty days, the Shuguang III would routinely change orbit and inclinations, rendezvousing with satellites or other objects in low earth orbit, including the space stations of rival nations. The notes of the Imperial Dragon, which had been disappeared by the Chinese Government as well as some recovered artifacts of the Imperial Dragon formed the base of a new, bigger program than the lunar landings, Project Wan Hu. On the Japanese and Indian side, the Chinese developments in space were looked at with mixed feelings, as the fact that the Chinese could use this for their hegemonic tendencies was not lost to the Asian nations. Japan had been busy to continue its development of native rocketry. The N-3 launch vehicle had proven to be a sound design and just two days after the Soviet MEK 1 left Earth for its fateful journey to Mars in 1988, it was used to launch the first interplanetary probe of japanese origin. Sakigake was the first Mars probe built by a nation other than the Soviet Union or the United States and entered into a Mars orbit in February 1989, where it began a mission of mapping the planet for the next two years. The probe operated for far longer than even NASDA had anticipated and provided the Japanese with higher quality images of the Martian surface than anything NASA or the Soviet Union released, who deliberately held back most high detail images of the Martian surface. The N-3 was not designed to get people into space and as such NASDA began with the development of the N-4 rocket, especially meant to transport humans and in this case carry a spacecraft with a crew of two. While the development of the N-4 with a payload capacity of ten tonnes, was well underway, the development of the spacecraft experienced one problem after the other. In another part of Asia, India was also working on their own space technology, yet concentrated on a different part. Since the first launch of the Advanced Satellite Launch Vehicle, the ISRO had concentrated on getting humans into space. They moved slowly and carefully, not willing to lose a single astronaut. Several satellites were developed to test the most important technologies needed for a manned space capsule. Multiple heat shield designs as well as materials were tested and the ISRO finally developed a rather simple actively cooled heat shield based on an ablative heat shield. With small holes into the ablative heat shield, it was possible to inject a cooling liquid directly into the reentry shock wave, cooling down the material by evaporation. Should the technique fail, the heat shield would still work ablative and could protect the payload. This meant that the capsule could be reused. Additionally the ISRO developed technologies to integrate a number of systems directly into the capsule, allowing for a better potential and more efficient reuse of the capsule. The biggest change compared to the spacecraft of other nations however, was the direct integration of a ‘pusher style’ launch abort system into the capsule. By 1993 the ISRO was close to finishing their own space capsule, the Manned Orbital Vehicle, MOV and launched a scaled down version of the five man design in 1994. The only problem with the Indian plans for manned space flight were problems during the development of a new launch vehicle for the MOV, the Advanced Launch Vehicle. During the Asian-Pacific Meetings, India and Japan approached each other for a potential joint venture in manned space flight. India had a space capsule that was close to being completed, while Japan had a launch vehicle that would be able to carry the capsule. Shortly after signing the Asian-Pacific Cooperation Pact in 1995, India and Japan signed the largely separate Space Cooperation Treaty, combining their efforts of sending their own astronauts into space. India provided their MOV and the Satish Dhawan Space Centre, while Japan added the N-4 launch vehicle and the Tanegashima Space Center. The MOV finally launched on June 5, 1995 from Tanegashima on top of an N-4 rocket, carrying only two astronauts, Takao Doi and Vikram Dhawan, into orbit, where they remained for three days to put MOV 1 through its paces. After reentry they watered two hundred kilometer west of the Indian coast. MOV 1 was returned to ISRO Satellite Centre for testing and refurbishing. The second capsule, MOV 2 was launched from an N-4 facility at Satish Dhawan, again carrying only two astronauts into space for a two week mission in space, which resulted in the first spacewalks of an Indian and a Japanese. Like MOV 1, MOV 2 was recovered from its landing site in the Indian Ocean and refurbished for the next mission. On August 1996 MOV 1 and MOV 2 were launched from Tanegashima and Satish Dhawan to rendezvous in orbit, followed by a docking maneuver and the exchange of the crews, who returned home in the other capsule. By 1998 both capsules had completed fourteen more missions and NASDA began to design a small space station that could be launched by a variant of the N-4, which used Indian built solid rocket boosters, based on the first stage of the ESLV. The ISRO meanwhile built four more MOV capsules. Almost on the opposite side of the world, Brazil was reaping the fruits of its labor and that of the OTRAG by providing cheap access to space for everyone who was willing to pay for the launch. Mass production of the Common Rocket Propulsion Units that made up the OTR launch vehicles had by now dropped to a mere one hundred thousand US dollar per module and the OTRAG factory was able to produce up to twelve of the modules per day due to its simple construction. 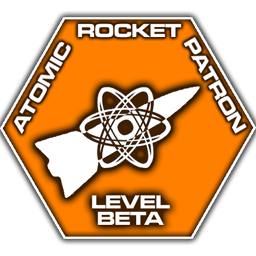 A positive side effect of the sheer mass of CRPUs launched during the development of the rocket family and later the actual use of the various sized rockets, the OTR family, was easy to get a man rating and use it to launch people into space. Rather than play safe and develop a conventional space capsule, the heads of the AEB decided to take a more risky way for human access to space. Once again they made use of some German know how, in this case of old files of Eugen Sänger, but also publically available information on the American Northrop HL-10 lifting body. During the mid 1980s to mid 1990s, Embraer was tasked with the development of a reusable space plane that could carry four humans into space plus a regular payload of a single tonne. It was expected that it would be carried into orbit by the OTR 361. This capped the overall mass of the space plane to about ten tonnes. Embraer presented the first SP-1 Santos-Dumont space plane mockup to the AEB and OTRAG in 1992 and the first aerodynamic flight tests of a first test article happened in 1994. The heat shield was the biggest challenge in the development of the SP-1, as it had to be reusable and was not to impair the flight dynamics of the lifting body. In the end, Embraer developed a tiled ceramic heat shield covered by a high temperature alloy that was used in jet engine turbines. In 1994, AEB had secured a cooperation with ESA for their manned space program. The cooperation was largely for AEB to get access to Columbus, though ESA would get access to the OTR family for low cost, low payload launches as well as the option to purchase the SP-1 and fit it to an Ariane II rocket. As such the SP-1 was equipped with a ESA low impact docking collar, hidden under a hatch in the top of the fuselage. The first prototype of the SP-1 was ready in February 1997, massing little over nine point seven tonnes due to the use of carbon fiber and other weight saving techniques that had been pioneered by the Europeans. After several AEB run tests, the SP-1 was mated to an OTR 361 and encased by an aeroshell as to not impair the flight characteristics of the launch vehicle. On November 23, 1997, the SP-1, named 14-bis, launched into low earth orbit, carrying two astronauts and a one tonne satellite. 14-bis remained in orbit for one week, where its systems were tested and the spaceplane changed orbit several times. It reentered the atmosphere on September 30 and landed safely on the Natal Air Force Base. The first flight of the 14-bis was a great success and the heat shield had proven its worth. Previously the reusability had been largely seen as a difficult matter, but 14-bis was checked and several broken tiles of the heat shield repaired over the course of a mere three weeks, before the craft was deemed space worthy again. The second launch of the 14-bis happened on February 4, 1998. This time, 14-bis was on its way to the ESA Space Station Columbus, where it docked on February 6. It carried some supplies for the station and several experiments. The four Brazilian astronauts remained on Columbus for three weeks before returning to Earth. As secondary part of the cooperation between AEB and ESA, the AEB had developed their own space station module to be berthed at Columbus. Designed and built by Embraer, the Schenberg module, named after a Brazilian theoretical scientist, massed nine tonnes and was equipped with two docking ports and a multitude of scientific experiments. On May 12, 1998, it was carried into orbit by an ORT 361, and with the help of a small propulsion bus rendezvoused with Columbus. It was then docked to the ESA station with the help of a Taurus. 14-bis returned to Columbus on May 28, and its crew opened the Schenberg module and activated it successfully. By the late 1980s access to space had become a way to gain international prestige and a number of nations tried to develop native space launch systems, rather than use existing systems. Zaire, with equipment confiscated from Lutz Kayser in 1977, tried to use the CPRU technology of OTRAG for their own gain of prestige. The system was first considered to be turned into a weapon system, but it could not be outfitted correctly. Later on it was used as base for a native space launch system, but the lack of actual blueprints and qualified aerospace engineers, the space program of Zaire failed in 1993. Israel had been developing their own native space launch capacities since 1983 and managed to launch their first satellite in 1988. Due to the political situation and safety concerns the Israeli Shavit rocket only had the capability to launch satellites into a highly retrograde orbit, which greatly reduced its payload compared to similar launch vehicles. The success of the Israeli space program and a fear of the Shivat being used as a weapon to carry Israeli nuclear weapons, made Egypt begin their own space program and develop their own launch vehicle, trying to use the Scud as a base for the launcher. A mixture of sabotage and a number of engineering problems while enlarging the Scud, failed to result in a meaningful success during the 1990s. By 1999 the various space going nations had 1400 operational satellites in orbit, with over 7000 objects larger than a baseball that were considered to be debris. That the debris could be dangerous to operational satellites, spacecraft and stations became apparent in 1995, when a burned out Demain 2 stage of an Ariane II collided with an American Navstar-GPS satellite. It destroyed both objects and created a shower of debris that slowly spread out, threatening other satellites.